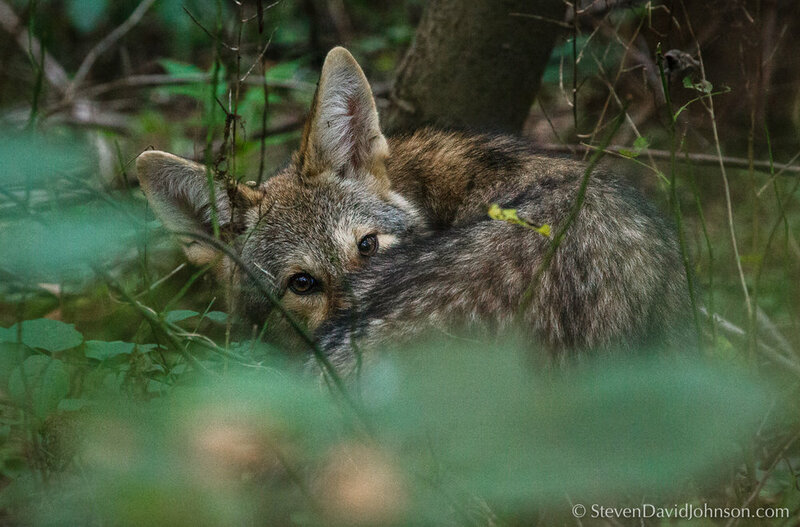 We've been happily and excitedly watching conservation photographer Steven David Johnson document his special encounters with a coyote family in Virginia since August on his Facebook page. 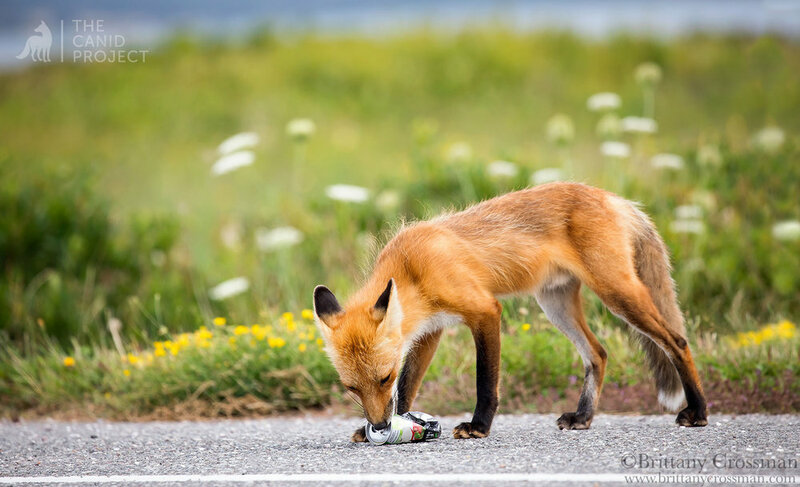 It's always cool when one comes across a photographer following a Red Fox family, and although it's not something you see every day, it definitely is seen more often than a photographer following and successfully documenting a coyote family. The minute I saw these images, I knew they were special. They were special, yes, in the sense that it's not a commonly seen photo-story, but special too because this is what coyotes need in order to show a world that too quickly dismisses them as vermin that they are so much more. 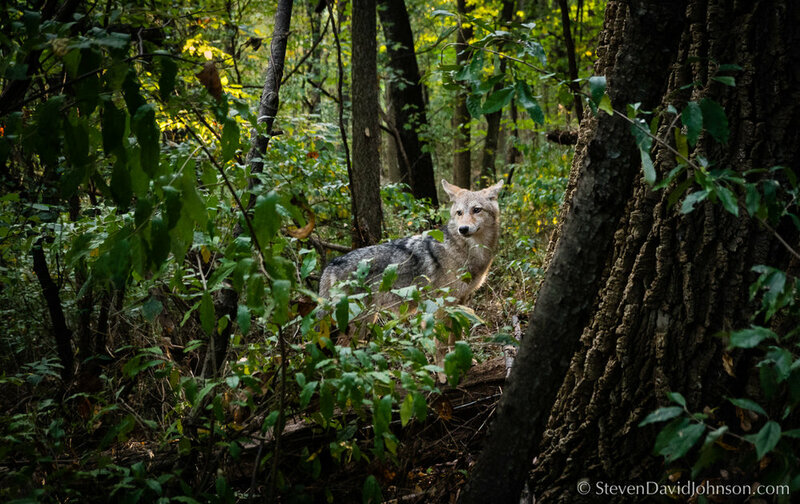 Steven's conservation storytelling by way of this photo series is really important work for coyotes, considering how persecuted they are, and have been, for decades. This series sheds a light on these animals as the sentient beings they are, with rich lives and personalities of their own. It shows their strong familial ties, especially this time of year when family units are strong. Click on images for full size version and mouse over for captions! "In early August, I was walking through our back woods in rural Virginia, and I came upon a group of coyotes. It was an amazing experience to look these creatures in the eye and see their intelligence and curiosity staring back. Over the next number of weeks, I observed the coyotes inhabiting an in-between space - somewhere between wild and domestic. While clearly very acculturated to human/rural life and human interactions, they also have their own will and purposes. And this made sense to me, as the lack of a parental unit was uncommon to see. Coyotes mate for life, and have strong familial ties. Unlike wolves, though, coyotes usually hunt solo or in pairs on small prey items like insects, voles, and rabbits. They do also eat berries and the like. They rarely hunt in packs but will if need be, especially in the winter months when small prey are harder to find and larger prey need to be pursued; they are one of very few species that seem to be this flexible. 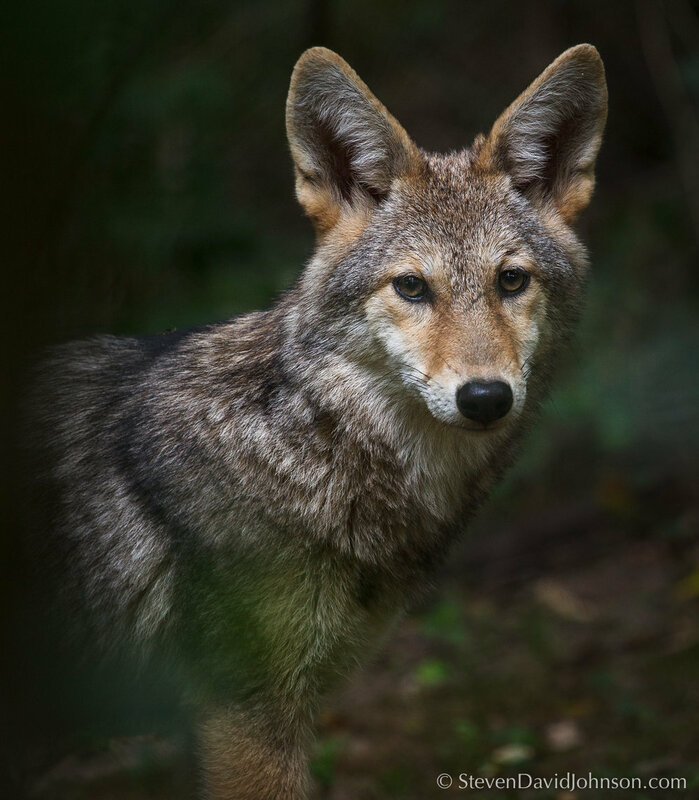 According to Dan Flores, the author of Coyote America, jackals and coyotes are the only other species besides humans that are a true 'fission-fusion' species, able to survive alone or join forces and work cooperatively together if need be (i.e. if prey animal is large, like a deer). This is the key aspect that has allowed them to expand as much as they have. I was watching two of the coyotes drowse in the creeping myrtle. When a third one came, there was a bit of agitation and playful nipping ensued. When the fourth arrived, THERE WAS AN ALL OUT MELEE. And it happened in complete silence - a furry ballet of leaping, wrestling, and teeth-baring. And they were all fine afterwards! We hope to see more of this story unfold and look forward to more of Steven’s valuable observations. Steven David Johnson chairs the Visual & Communication Arts and Theater Department at Eastern Mennonite University in Virginia’s Shenandoah Valley. Steve is an Affiliate of the International League of Conservation Photographers, and his photography of the natural world has appeared in Orion, BBC Focus Magazine, National Geographic Kids, National Science Teachers Association Press books, and numerous conservation publications and journals. In 2013, he introduced a new university course in Conservation Photography. Topics include aesthetic responses to nature, visual documentation of ecosystems, and an exploration of the relationship between human communities and the natural world. In the course of the semester, students work on a major real-world project in partnership with regional conservation organizations. When not in the office, you’ll probably find Steve coyote-watching or half-immersed in a vernal pond photographing Appalachian salamanders.